For centuries, people have painted cities as unnatural human conglomerations, blighted by pathologies such as public health crises, aggression and exorbitant costs of living. Why, then, do people throughout the world keep leaving the countryside for the town? 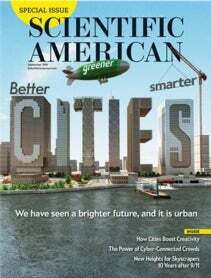 Recent research that is forming a multidisciplinary science of cities is beginning to reveal the answer: cities concentrate, accelerate, and diversify social and economic activity.